I don’t know if you can beat a flapjack. Not only because it is quick, so easy and made from things you probably have in the cupboard. No, more in terms of what it delivers. 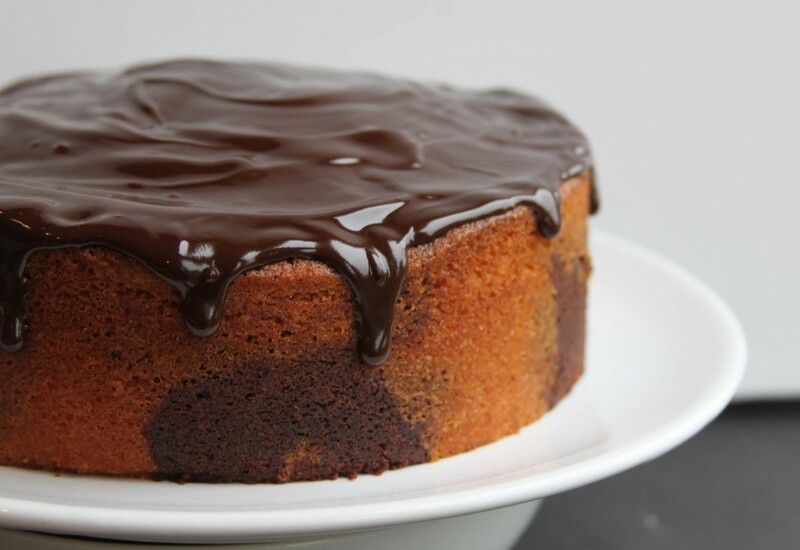 Sweet, chewy, toffeeish (is that a word?) and supremely satisfying. A perfect mouthful. My children have just been for an adventure in the woods, along with two friends, and part of the supplies taken on this expedition were flapjacks. Just the thing on a chilly and breezy half term Wednesday. They came back pink cheeked and jolly from their jaunt and all with room for one more piece – in the nick of time I might add as the friends’ Mother and I were slowly working our way through the rest of the tin. 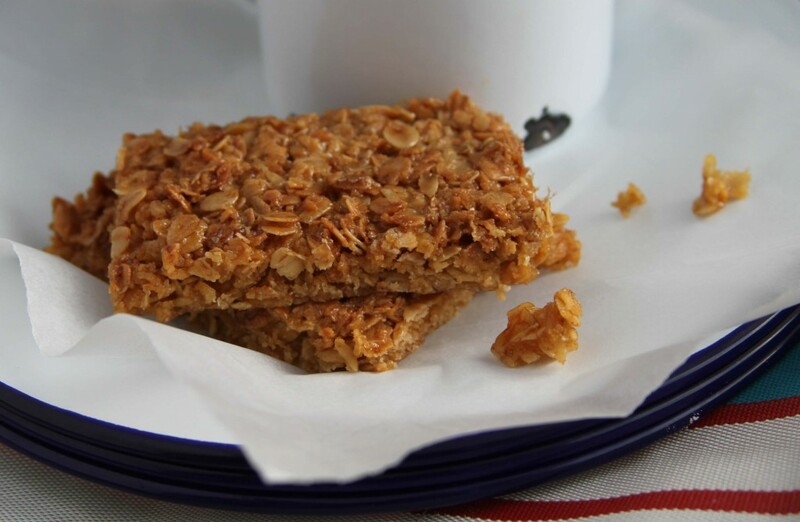 I have always loved Flapjacks and homemade are infinitely better than bought. You can customise as you please, chewy or crisp (cook a bit longer) – add raisins, seeds, nuts or chocolate chips. In short, these are the ideal treat to whip up this half term. Yes there are many more exotic cakes and confections that you can make if you have the time (and energy). For me though these hit the mark exactly, quick, easy and somehow just right. 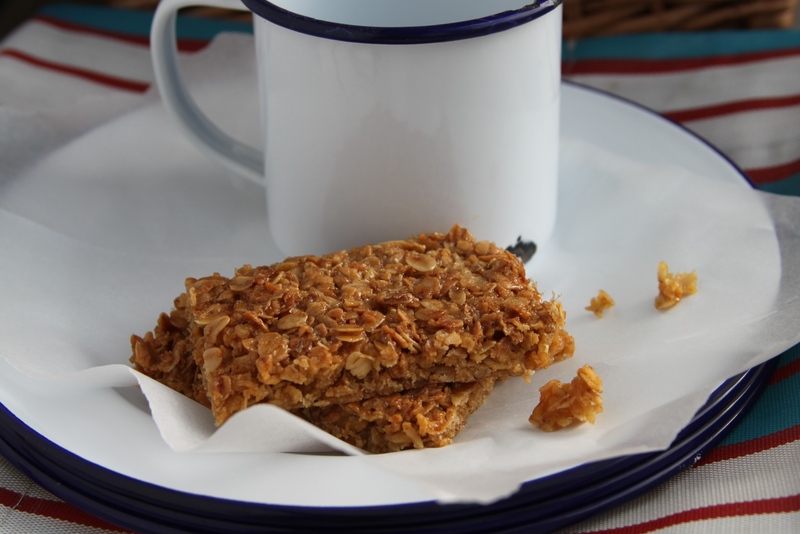 I think of flapjacks as old fashioned and nostalgic and for some reason always make them with Imperial measurements. I find this the easiest way to remember them and I know these amounts make flapjacks just how we like them. You can use 4oz of sugar if you want them a little gooier but I find 3 is just right. Preheat the oven to 170 and line a tin around 8 x 26cm with baking parchment. Put the butter, sugar, syrup and salt into a large pan and melt gently. Add the oats, give it all a good stir and spread in the prepared tin. Bake for 10-25 minutes. Remove from the oven and leave for 5 minutes before marking into bars. Leave for a further 10-15 minutes before trying to separate – any sooner and they might fall apart. I have felt a little caked-out recently following my Macmillan coffee morning but it is a dreary rainy October day in Dorset so there is only one thing to do – bake. I make no secret of my fondness for a well stocked cake tin (Lemon Cake and the 1970’s, May 2013), perhaps because when I was young a slice of cake was a proper treat. It still is actually and ideally a weekly one and not something just for high days and holidays. I may be sporting my rose coloured specs, the ones I usually view the 70’s with (blazing hot summers and superb music, forgetting strikes and power cuts etc) but I’m sure cakes were always homemade and whipped out triumphantly for weekends tea. The only bought ones I can remember were something called a Country Manor Cake, a sort of light fruit cake with a demerara sugar topping which I was strangely fond of and the fabulous fluorescent Battenburg which enthralled me with its colours and the marzipan which I would peel off. A marble cake was often the star at these teas and it seemed somehow exciting and exotic, what with its different flavours and swirls. 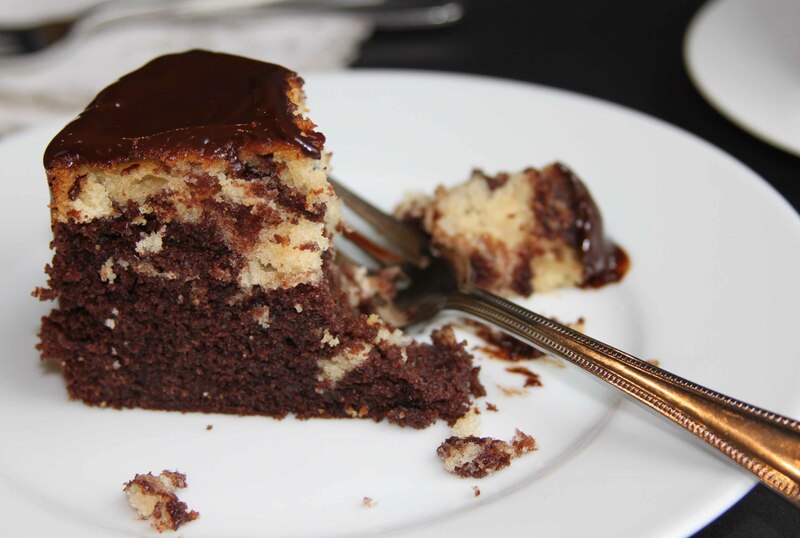 Many (many) years on I decided to make a marble cake and was delighted that my children were just as excited by the pattern and having both chocolate and vanilla flavours in one cake. So much so that my son requested a marble cake, and it absolutely had to be a marble cake, last week when he had a friend from school over for tea. You will see from the photographs that my marbling and swirling isn’t brilliant, artistry in cakes not one of my strengths and I doubt I will be troubling Paul and Mary any time soon. The pictures are also the best I can do on a grey overcast day but I hope they convey the lovely texture of this easy and delicious cake. Please, please do make it. I use both milk and plain chocolate for the icing, all milk I find too sweet and all plain my children find too dark. The mix of the two seems just right but as ever, adjust to your own tastes. Preheat the oven to 170 and grease a 20cm tin which is at least 6-8cm deep. Whizz the butter and sugar together until light and fluffy. Add the eggs one at a time each with a spoonful of flour. Once these are incorporated sift in the reminder of the flour along with the baking powder and salt then add the milk and vanilla. Put half the mixture into another bowl and sift the cocoa into one lot, mix well. Drop spoonfuls of the mixture into the prepared tin alternating vanilla and chocolate. Run a skewer through the blobs marbling as you go and then bake for 55 minutes. Check after 45 in case it is browning too much on top in which case lay a piece of foil over it. When a skewer comes out clean leave to cool and then remove from the tin. 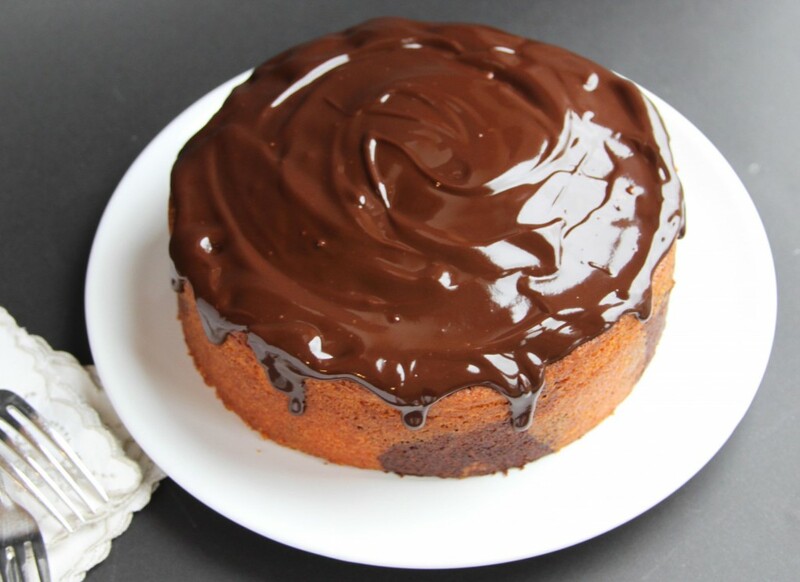 For the icing, melt the chocolate and butter in a bowl over a pan of simmering water then add the milk until you get the consistency you are after for the icing, I find one tablespoon is usually enough. Pour over the cake and dig in. Don’t call me a swot but I just love vegetables. More so than fruit I think and this time of year brings an amazing vibrant selection. Beautiful and delicious, pretty as a picture and so good to eat. My vegetable garden is coming to the end of its growing season and just has a few courgettes and late runner beans on offer, but no matter, my wonderful farm shop down the road (Washingpool Farm Shop, near Bridport) is full of earthy seasonal treasures. So far this week we’ve had Celeriac and Spinach soup, Beetroot and Parsley soup with a little horseradish cream and Cauliflower Cheese. Ahh, Cauliflower Cheese, shockingly overcooked and watery at school but a thing of pure delight when done well. Whether you go for a proper béchamel with cheese or the quick creme fraiche with grated cheese route, I love this supper. Looking back at what we were eating last time it was chilly I found the Late Autumn Salad (November 2012) with earthy roast beetroot and salty crumbly feta. 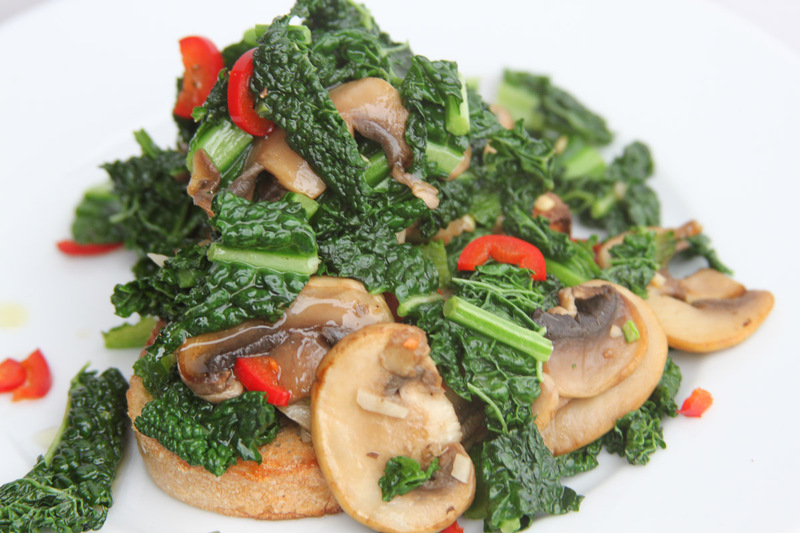 Another favourite is the Kale, Mushrooms and Chilli on Sourdough Toast, pictured above (January 2013) which is not only delicious but feels so full of goodness. To go with a cup of tea you can’t beat Patrick’s Plum Cake (October 2012) squidgy and delicious with almonds and plums. What I am looking forward to now is Plum Crumble, hot juicy tangy plums with a sweet crunchy blanket of crumble on top, the purple juices seeping up making it sticky and chewy. 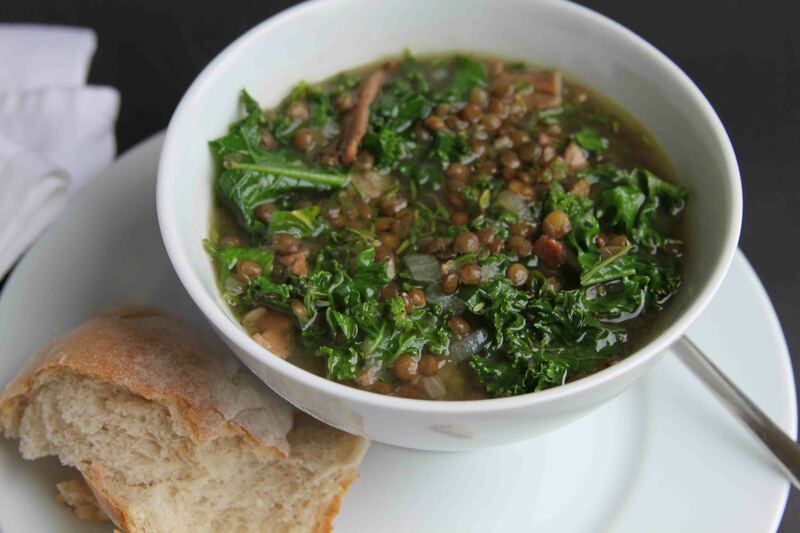 Or celeriac remoulade, at once both crunchy and creamy with some lovely air dried Dorset ham – what could be better on a crisp sunny day with perhaps a glass of cold cider on the side….. Or maybe this Kale, Lentil and Bacon soup. A super cosy, warming yet fresh and healthy soup if ever there was one. Earthy lentils, verdant good for you kale and a little salty hit of bacon. So good. As ever, I feel a splash of dry sherry enhances a veg based soup but it is up to you. A really cracking result depends on a good stock, I don’t always make my own (I know, I know) but ensure I buy a top quality one. I used chicken stock here but you could use a vegetarian one, omit the bacon and make this vegan should you so wish. Cook the bacon and onion in the oil until soft. Add the lentils, give it a good stir then add the sherry. Let it sizzle briefly, pour in the stock and cook until the lentils are just about done. Stir in the kale and thyme and cook for a minute or two until the kale is wilted. Serve with some good crusty bread. Enough for 3-4 depending if there is anything else for lunch. There are some things that follow you through your life and so it is with what we eat. We might cast some aside if they become dated or our tastes change, for instance I don’t miss the Vesta Chop Suey, Smash or Instant Whip. A Crispy Pancake has never graced my table and I must admit to not being a fan of the Arctic Roll…. Others though follow and accompany you. One such friend that I am always delighted to come across is the burger, slider or hamburger as they used to be called. I remember the excitement of my first Wimpy, enthralled by the red restaurant on the side of the road and this funny little patty in the soft, slightly sweet bun. Then, a real childhood treat, the Hard Rock, that noisy rocking joint on Piccadilly in London with the waitresses dressed as proper American diner gals and guitars on the walls. The burgers were big and juicy and the milk shakes so thick your straw really did stand up in them. As I got older we would frequent a place on the Fulham Road called Parsons which had a monster called an All the Way, and I’ve enjoyed many Tootsies burgers with that real flame grilled flavour. 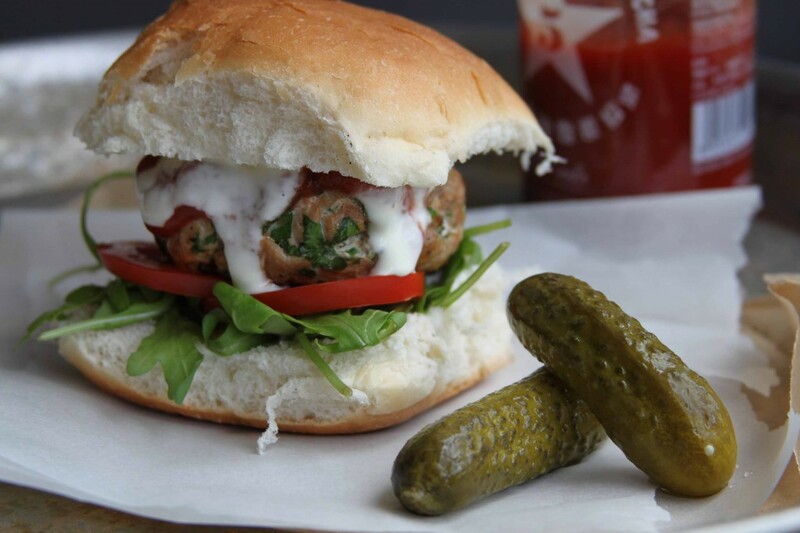 The veal burger at The Boxwood, the superb GBK and the likes of Dirty Burger bring us nearly up to date. During these years there were of course the hamburgers at home. Regular patties, usually beef were (and still are) a favourite lunch. The table would groan under plates of tomato, lettuce, pickles and cheese so you could build and create your own bespoke masterpiece. There was ketchup, American mustard, mayonnaise and do you remember Cubits pickles, green, red or yellow. The burger remains on my party list to this day. 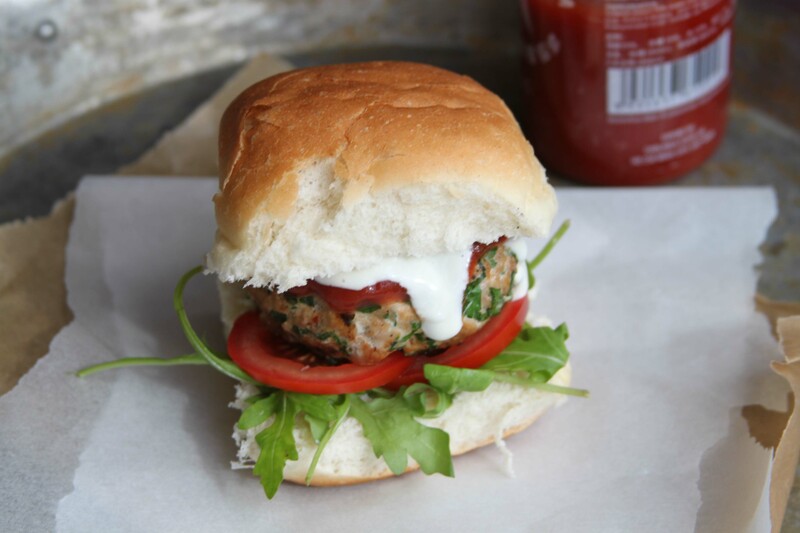 Now though it might be lamb or turkey mince, salmon and tuna can make a fine fish burger too. Chopped herbs and spices are added, various chutneys, salsas and mayos offered on the side. It might be a normal two handed number or one of these new fangled little sliders. It doesn’t matter, the principle remains unaltered and why shouldn’t it, a good burger is pretty much perfection. Turkey, rather like a puppy, is not just for Christmas (does that sound a bit wrong? You know what I mean). Yet for so many that is the only time it makes the table. 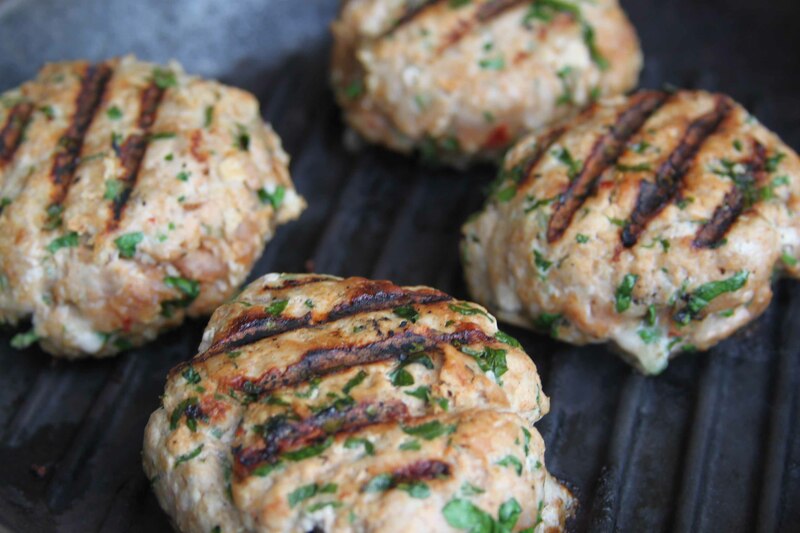 Turkey is good for us, not too expensive and makes a very good burger – give this one a try. Mix everything together really well, your hands are best for this. Fry a very small amount and taste. You may need more seasoning or harissa if you want things a little more fiery. When you are happy with the mixture, divide into 4, roll into balls and then flatten into the traditional patty shape. Heat your griddle or frying pan and cook – the ones you see pictured took about 8 minutes on each side, you can make a little cut into one and check if it is done. Serve with the garlic mayo and any other accompaniments you want. Mix it all together in a bowl and serve with the turkey burgers.